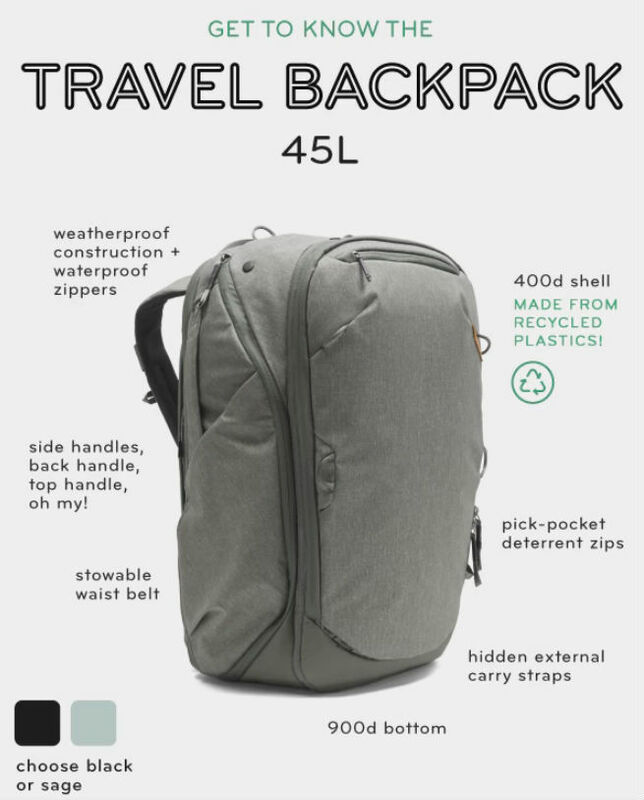 I had the chance to check out Peak Design's new Travel Line 45L bag, and I have to say, this sucker could be a game-changer. Peak Design rolled out the bag on Kickstarter back in July, and as of this writing, they've gotten more than 6x the pledges that they were looking for. Not bad! 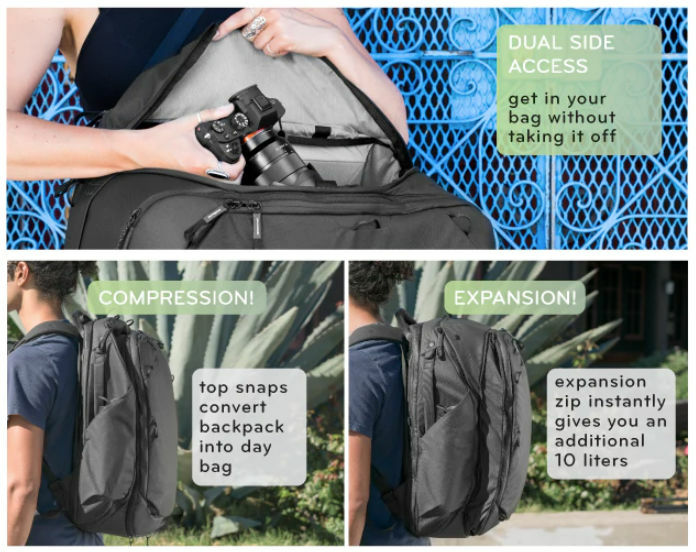 All that support on Kickstarter is no doubt a result of Peak Design consistently putting out top-notch bags that photographers love and appreciate. 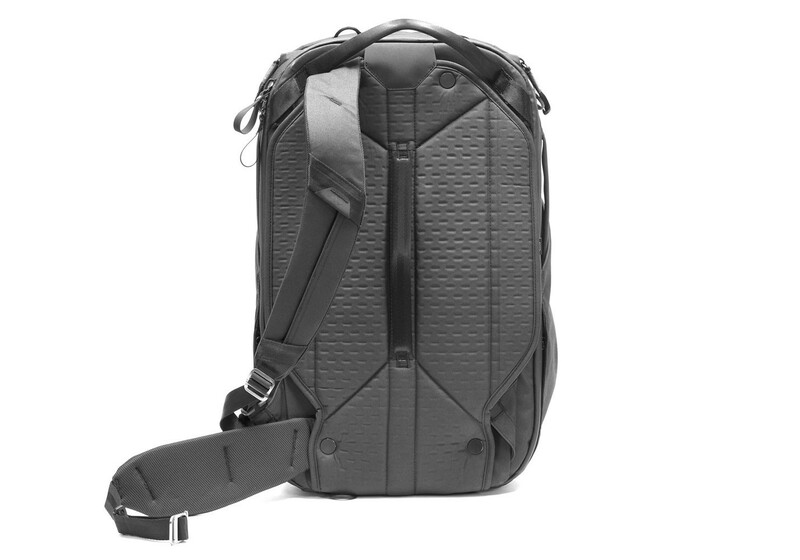 And I can tell you right now that that trend will continue with the Travel Backpack 45L. As you can see in the graphic above, Peak Design went all-out in the features department. Not only is this bag weatherproof with waterproof (and pickpocket-resistant!) zippers to keep rain and snow at bay, but its shell is also environmentally friendly. The big, padded waistbelt helps distribute the weight of the bag to your hips, but when you don't need it, it's easily stowed out of the way. In fact, the shoulder straps are nice and beefy, too, and they also stow away when they aren't needed. There's tons of handles, too - on the top, side, and back - for easy pick-up no matter how the bag is laying on the ground. 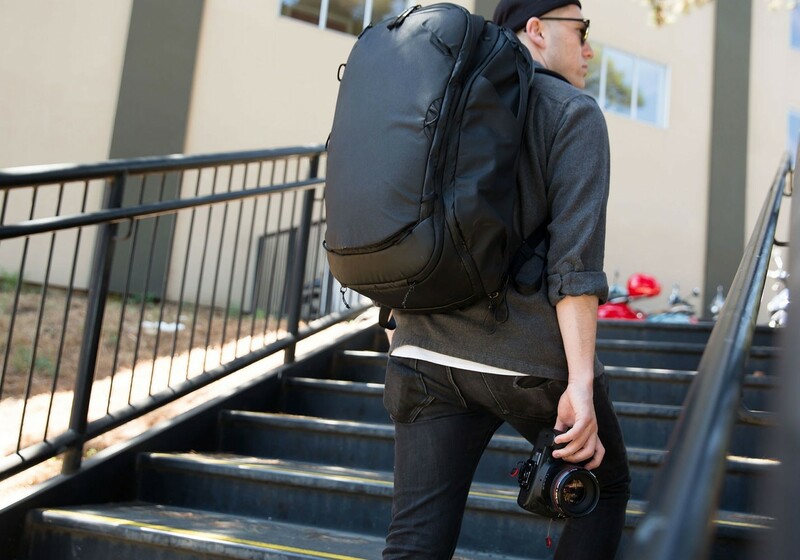 That makes it a perfect carry-on back for photo adventures that take you far from home. When you open the bag, you can see every nook and cranny thanks to the big flap that opens fully. 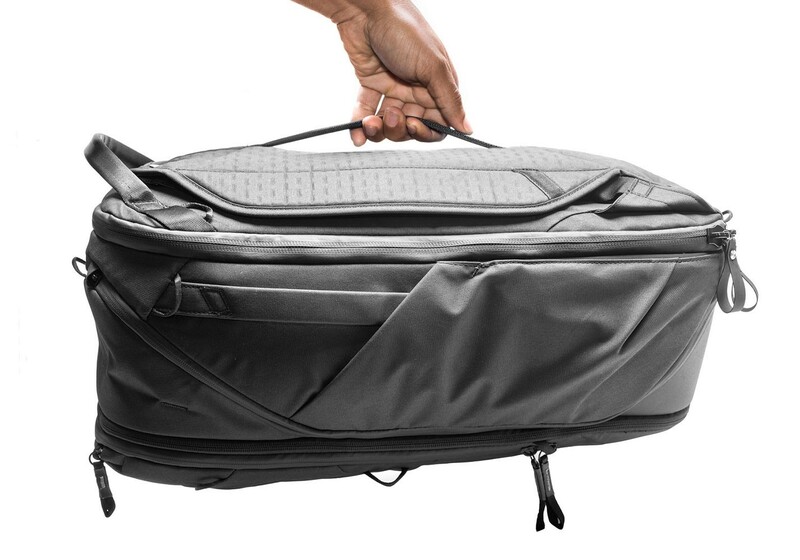 You can fit a ton of stuff in this bag, which makes it ideal for one-bag travel photography trips. To keep all your stuff organized, Peak Design has implemented a dedicated organization panel that has plenty of pockets for all your smaller items. The bag can compress to save space when you don't need it, and for longer trips that require more gear, it can easily expand to accommodate. In fact, with a simple pull of a zipper, you can add 10 liters of additional storage to the bag. That's a lot of extra space! 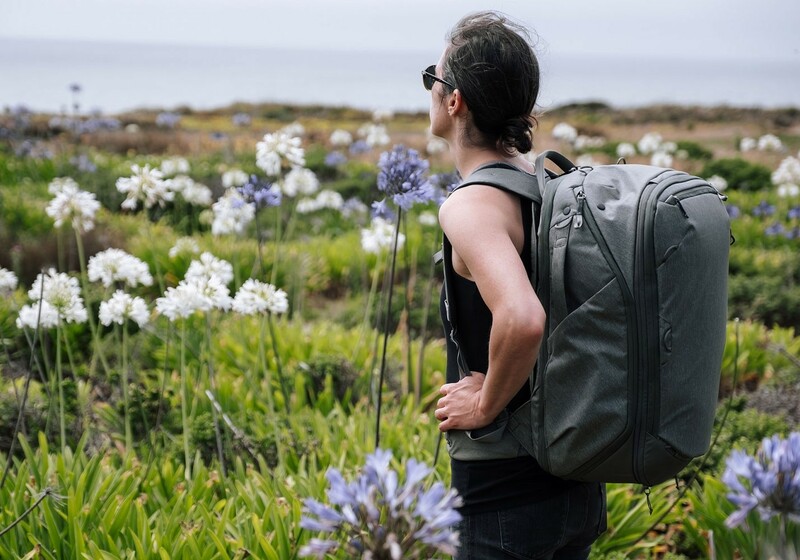 The bag has a dedicated pocket for a tablet or up to a 15-inch laptop, two expandable side pockets, two hidden exterior pockets, a pocket on the waist belt, and 12 external carry strap attachment points for adding even more storage. Peak Design has incorporated side access and full back access points so getting the gear you need is just moments away. So, in a word, this thing is impressive. In fact, it's so impressive that I'm struggling to come up with ways to tell you just how awesome this bag is. Aside from the bag, you can also opt to include Peak Design's super-smart pouches and cubes with the bag, which make it a complete travel system. Whether you need a pouch for your toiletries or a cube for your camera, there's a solution for you. 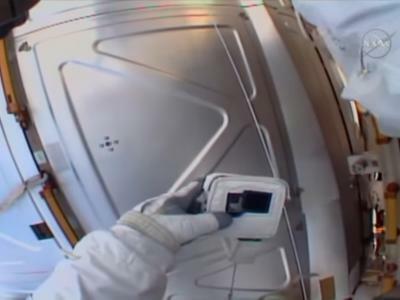 The bag can accommodate three cubes in the main compartment, with each cube serving a different purpose if need be. 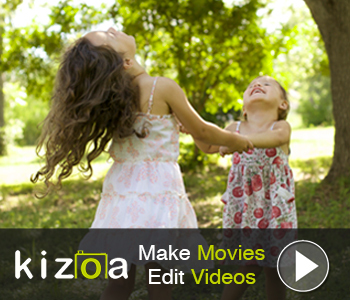 Put your camera gear in two cubes and your clothes in another, and you're ready to hit the road. 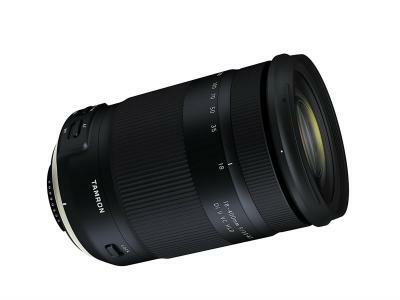 The camera cubes come in small, medium, and large sizes, which can accommodate an array of gear from a mirrorless body and lens all the way up to a professional kit with multiple lenses. There's even a cube specifically designed for drones. 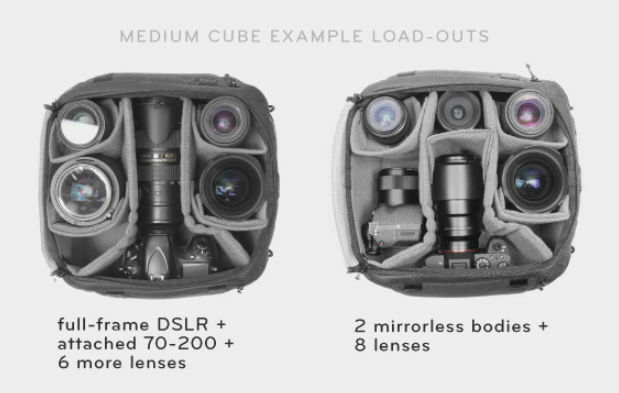 The cubes also have flexfold dividers that allow you to customize the space, as well as a floating pocket that gives you further ability to make each cube perfectly fit your camera gear. The thoughtfulness of function and design appears in the other cubes and pouches that go with this bag. 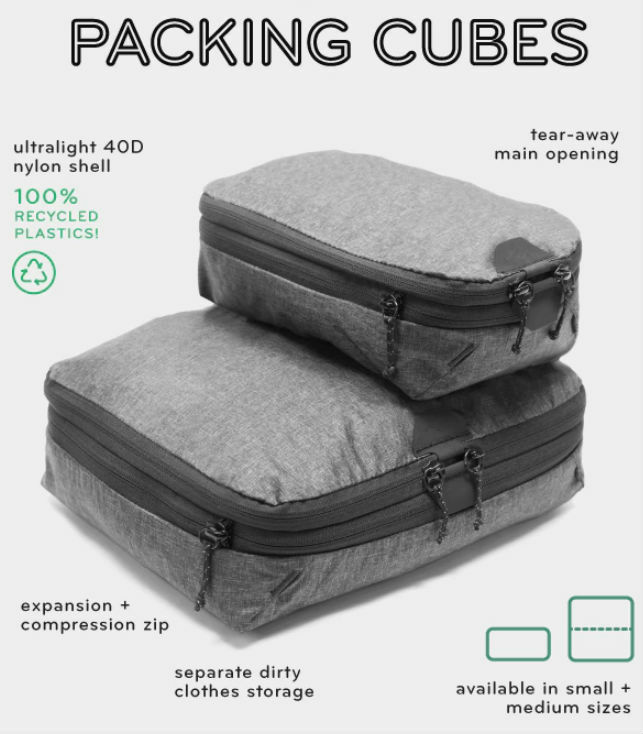 The packing cubes can expand and contract to meet varying needs, and they have a large opening so you can actually see what's inside. Better still, there's an integrated dirty clothes compartment so don't have to worry about them getting tossed in with your clean clothes. 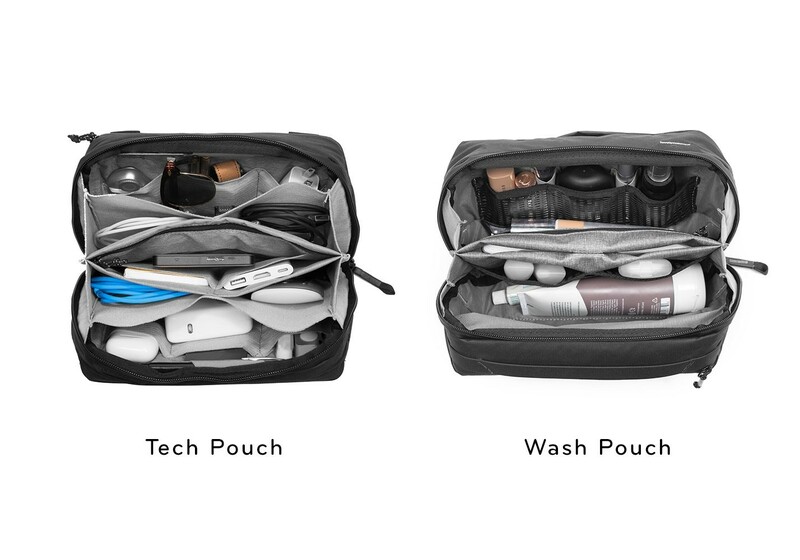 Add to that available pouches for tech items, shoes, and toiletries, and you've got the makings of a bag system that will help you keep absolutely everything you need on a trip nicely organized and accessible. If it isn't apparent, Peak Design really has thought of everything here. The bag is comfortable to carry. You can pack tons of stuff in it. There's easy access to your gear. And with the pouches and cubes described above, the bag has an incredible ability to hold all your gear and keep it organized at the same time. 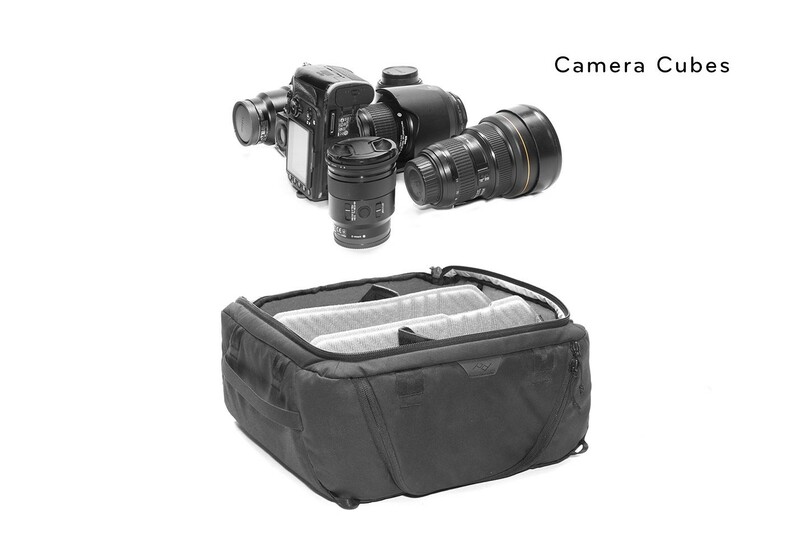 If you're a travel photographer and you aren't excited about this bag, you might need to check your pulse!